There are two basic types of Uruk-hai in the Lord of the Rings movie trilogy. Those in Fellowship of the Ring are "light infantry", raiders who are lightly armored for fast movement. The Two Towers, however, includes whole armies of "heavy infantry", with a lot more armor and pole arms. I'm going with the "lights" at first. Some of the basics are the same for the heavies (loincloth, shirt, shoes, breastplate), it's just a matter of adding more armor. There are also crossbowmen, sappers, and berserkers, and the Warg-riders are another story entirely... But I'm not messing with any of that at the moment. 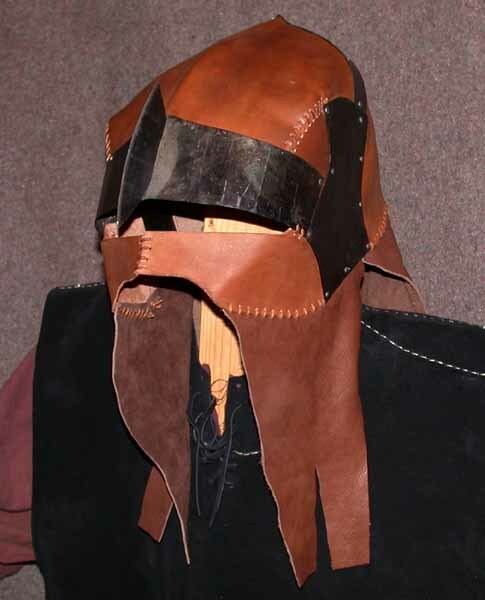 My helmet is six panels of leather, with four black steel reinforcements and four leather flaps. The two main leather panels, top and back, are shaped with a raised central ridge. The steel band over the brow has a sort of vertical blade at the center, like a nasal. I formed the large leather pieces by soaking and stretching them over a 17th century pikeman's helmet (which has a handy central ridge). 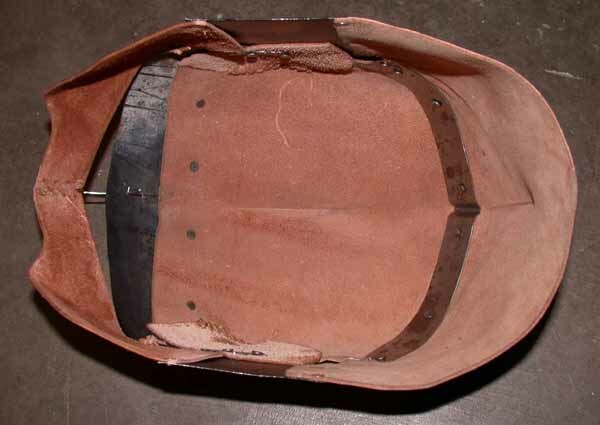 Interior of the helmet before the flaps were added. To make the leather fit tightly along the steel band over the top, I placed an identical band inside and riveted through all three layers. Worked perfectly! The exact number and placement of the rivets seems to vary slightly from one helmet to the next, so I used an extra pair at center front. The way the blade is fastened can be seen, the long tab inserted through a slot, cut into 4 segments and bent alternately left and right. Some of the helmets in The Fellowship of the Ring and most of those on the "heavies" in The Two Towers are the all-steel version, with a wide black "crest" mounted across the top of the helmet, from side to side. These usually lack the blade at center front, but have two larger horizontal blades at the lower edge on either side (actually part of the side plates). There are excellent high-resolution photos on the Alley Cat Scratch Orcs page. 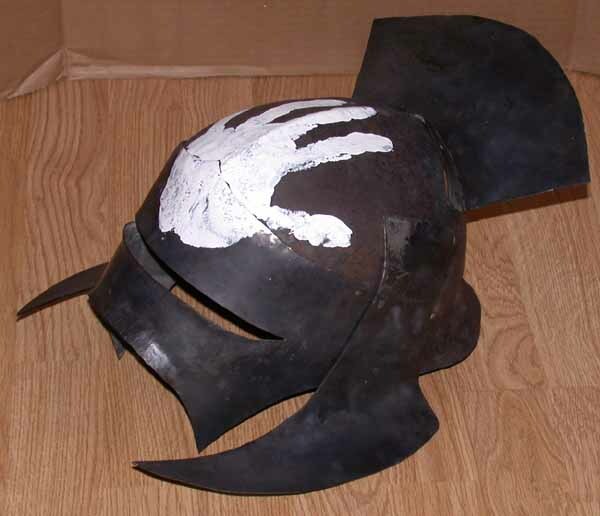 Also see Scott Maple's heavy Uruk-hai helmet and armor, http://webhome.idirect.com/~tk421/urukhai.htm. Click here for my patterns. These are only approximate! You will have to play with them and make adjustments. Remember also to leave a half-inch or more all around the two main pieces for holes or clamps for stretching the leather over the form. These patterns should be helpful for the all-metal "heavy" version of the helmet as well, and a little extension is shown on the top piece (where the little insert is laced in on the leather version). The side plates will be a different shape, though, with the blades on the bottom that get bent outwards. Helmet under construction. At left, the back leather panel is being formed, stretched while wet over a 17th century helmet (with a plastic bag between to keep metal and wet leather apart). Next to that, the top leather panel has been shaped but not trimmed, and is taped to cardboard patterns of the metal frame pieces. The pattern for the front leather pieces is at right, and the metal side plates, not yet blackened, are in the foreground. My helmet has come out quite satisfactorily, but hardly perfect. The eyeslot is kind of wide, and the front leather pieces are very flexible and may be pulled out of shape by the flaps--some kind of reinforcing may be needed. The shapes and proportions are very hard to capture, and shaping the ridge in the leather was a pain. But it gets the point across! And it fits over my mask like it was made for it! 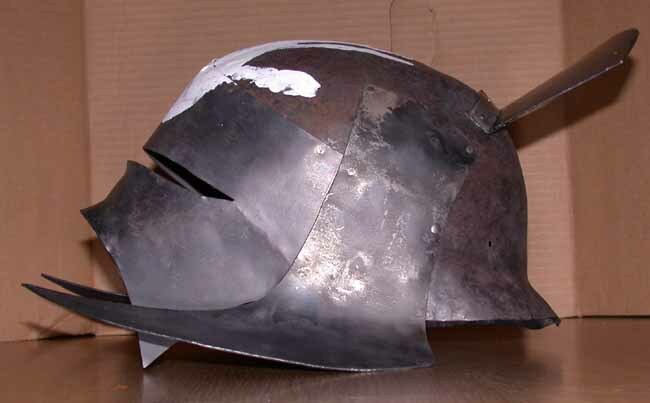 This helmet is the "heavy" swordsman's helmet, all fire-blackened 18- and 20-gauge steel. There is also a view from the side and the top. 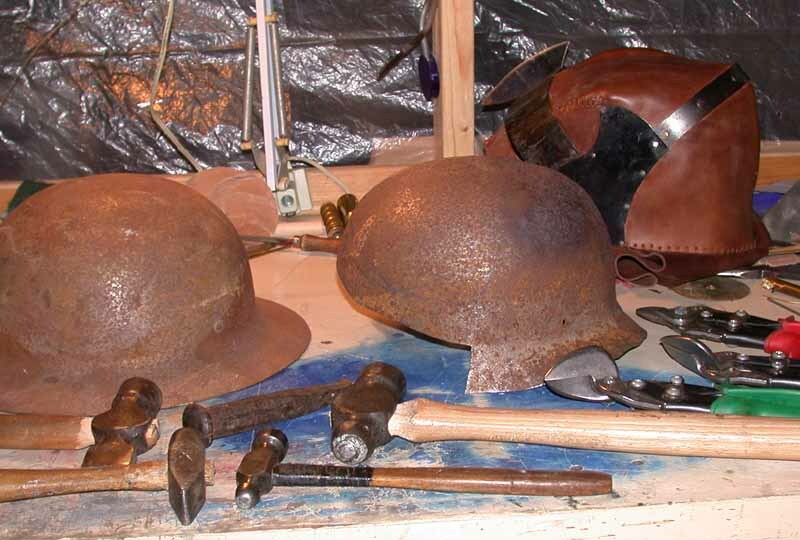 I started with a rusty Civil Defense helmet as shown at right (another is shown to the left of the one being chopped), trimming the brim and dishing the back of the bowl to try to give it a blockier shape. The patterns for the leather helmet helped to figure out the parts for this one, but I still had to do the face section twice. It was a lot quicker to make than the leather helmet, due to more experience and having a bowl to start with. Total weight is 3-1/2 pounds. It still needs the chinstrap and some kind of lining. The overall shape and proportions are still a little off, because the Civil Defense helmet was not really the ideal shape to start with. But what the heck, it was free, and I can still try dishing the bowl out from scratch if I want to do another one. And it certainly captures the spirit of the thing! The body armor was very hard to figure out! There seemed to be two or three different styles, some segmented and some with a solid breastplate. But now I believe that all the armor is based on a short solid breastplate. 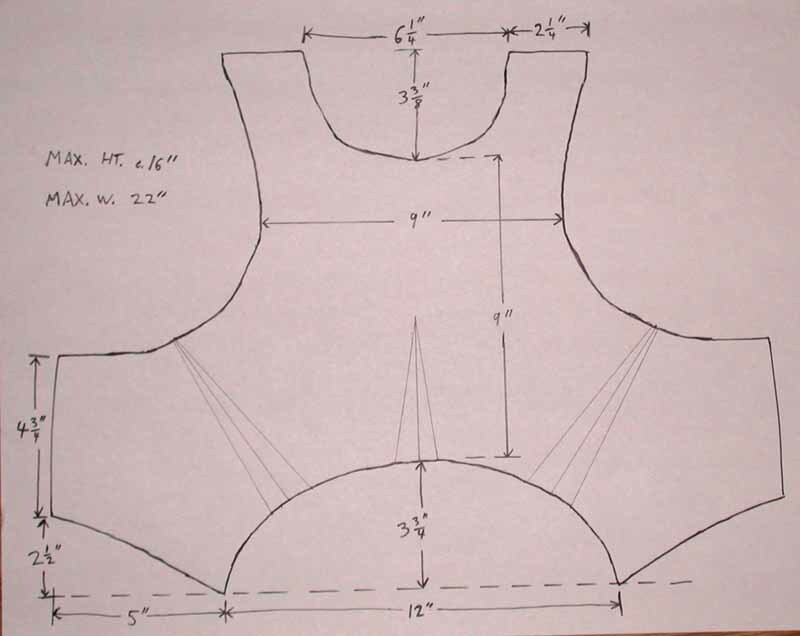 The lower edge is curved upwards, and there are three V-shaped ridges, one running from the bottom edge to just above the bottom of the armhole, and one on each side running from the armhole to the lower edge. 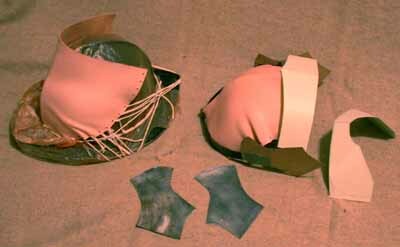 Below are three pairs of plates or lames hung on internal leather strips, making them articulated. There is a slight gap where each pair meets in the center, showing a rivet on either side and sometimes a glimpse of the horizontal leather strip that joins them. The straps at the top cross in back and buckle at the sides. 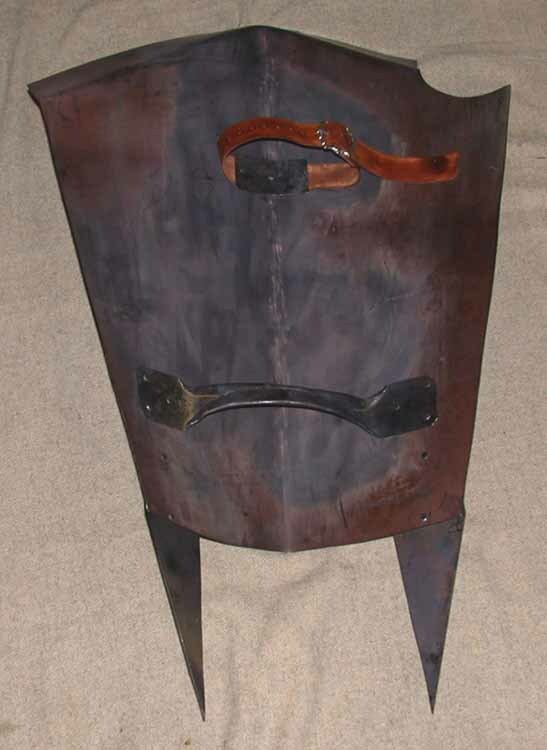 My armor is made of c. 18 to 20 gauge steel (an old shelf). It has been blackened by heating in a fire to burn off the paint and then rubbed with wax and tallow. 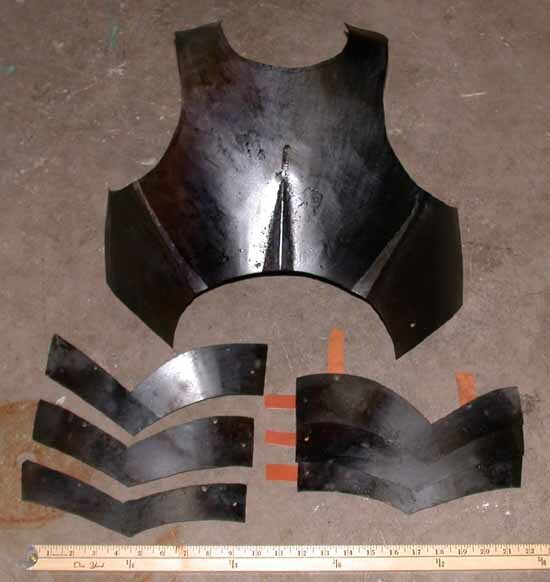 At right is the armor in progress--one set of lames is shown unassembled, the others are riveted to their internal leather straps and ready to be joined to the breastplate. Next is the inside, showing the leather articulation. 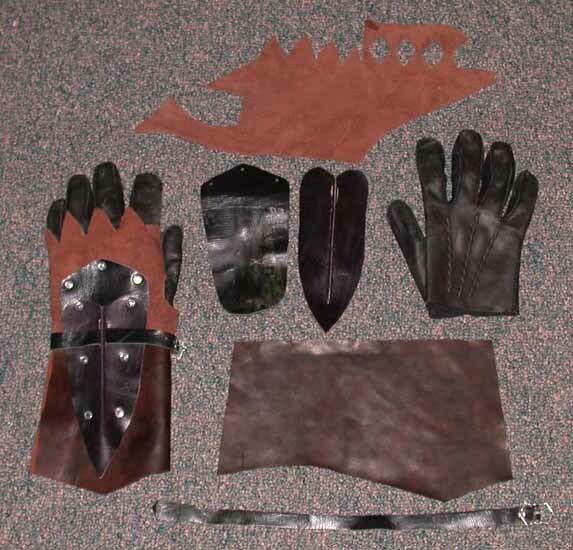 Far right is my pattern, along with patterns for the pieces on the backs of the gauntlets. Now, many uruk-hai seem to wear body armor which is segmented all the way from top to bottom, and this is where the tricky part comes in. 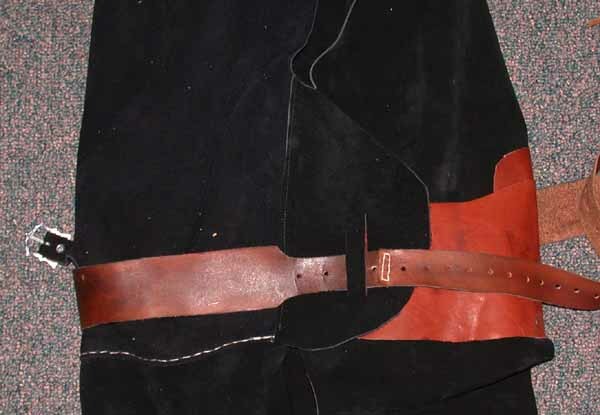 Several photos show the upper two "segments" to be a different color and texture than the lower three--they are not metal but a leather "over-vest" (for lack of a better term) in two layers, a sort of leather dicky as it were. 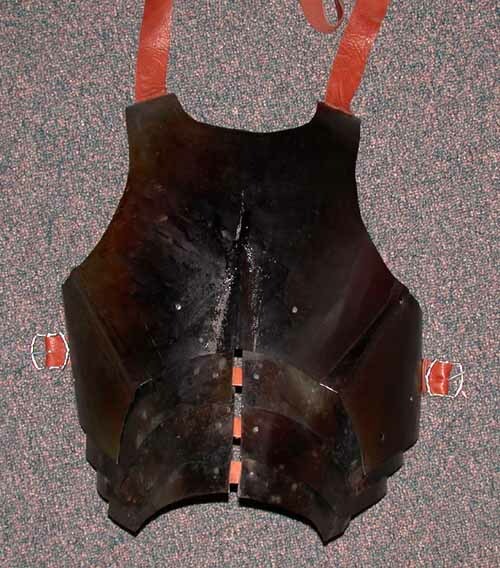 The lower layer has a formed ridge in the middle, corresponding with the central ridge on the metal breastplate, and it also has a pair of rivets as the lower lames do. The upper layer is two pieces whose blunt points meet at the middle with another pair of rivets, probably securing them to the lower leather layer. The upper layer includes the "dangly bits", two pointy flaps on either side that serve no purpose. The outer one is riveted, along the armhole, to a piece which holds a buckle. The upper one, more visible, is actually actually about 6" longer than it appears, since it is folded up and then stitched or riveted so it hangs down. The over-vest apparently extends all the way up to the neck opening, where a pair of straps go over the top of the breastplate's shoulders. I have made them cross at the back and buckle at the sides, and they lie right on top of the breastplate straps that do the same thing. The central ridge in the bottom layer was formed by folding the piece in half and gluing a cord in the fold. When dry, I unfolded it and glued a strip of leather over the cord to keep the ridge from stretching back out again. Here's the pattern, on a 1-inch grid. 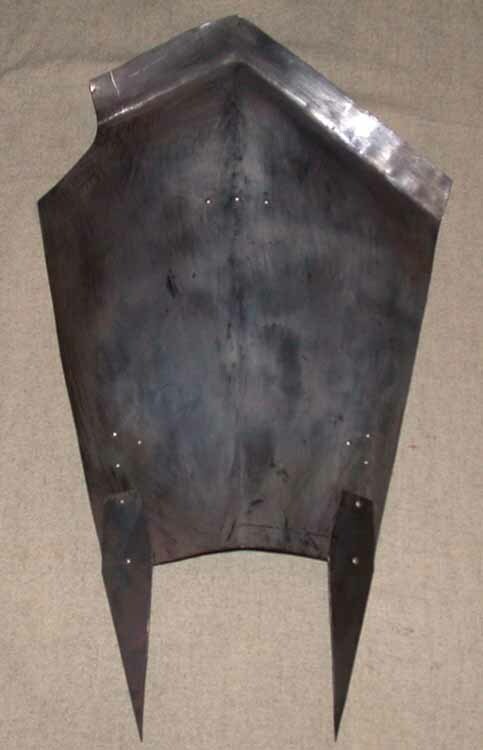 At the front, between the belt and the breastplate segments, is some kind of "belly piece". 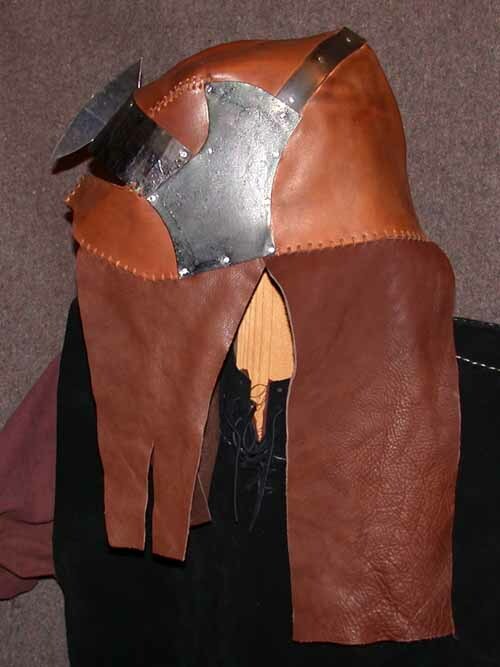 It is leather, with both top and bottom edges rounded upwards, and it has a central ridge (like the over-vest, and the gauntlets, below) and six rivets on it. It is made in two layers with the lower projecting above the upper one by an inch or so. Overlapping it on both sides are the round-ended flaps or extensions of the back panel of the jerkin, which wrap around either side towards the front. My guess is that the belly piece itself is riveted to the jerkin and that the belt simply holds the jerkin shut at the waist. The belt loops on the flaps are just pairs of slits. Below this mess hangs a pointed codpiece, maybe optional, made of two layers of heavy leather with the usual ridge and rivets. The lower layer extends upwards to attach to the belly piece. Must be terrible to run with that thing flapping around... (Though some appear to be a little more flexible.) Mine is tied to the under-layer of the belly piece with a couple thongs, so it's detachable. 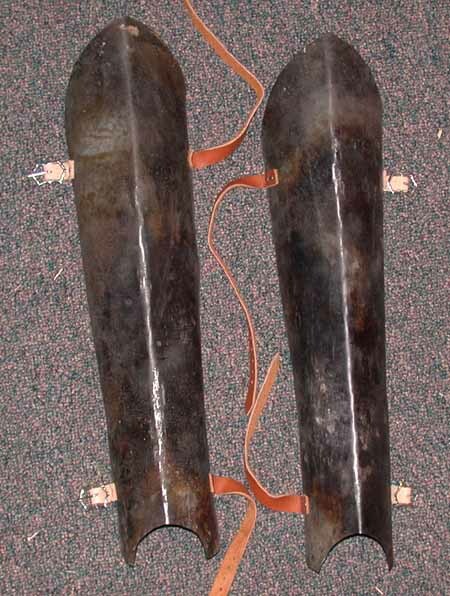 The greaves or lower leg guards are made of black steel, and there are two styles. Some are a simple shinguard, with a slight point at the top, a medial angle or ridge, and the bottom edge cut out in a half-circle to fit over the instep. Each greave is fastened by a strap and buckle near top and bottom. Note, however, that the top is not dished out to create a space for the kneecap, so the rest of the greave needs to be padded to allow it to fit properly. The second type has a plate covering the back of the leg as well, which would be more difficult because it's a more complex shape. Both types are clearly visible in the photo of Gimli sitting on a dead Uruk-hai at Helm's Deep. I went with the simple option! NOTE: The greaves should NOT be resting on the top of your foot! This will cause you pain. The weight of the greave should be supported by the upper strap, at the top of your calf muscle. The lower strap only needs to control the bottom end. So trim that bottom end higher if necessary, and make sure the top of the greave is nicely padded and firmly strapped. The gloves or gauntlets are also rather "busy" items, and a photo in The Two Towers Visual Companion shows the palm but raises even more questions. The cuffs extend to about mid-forearm. On the back are three layers of leather, riveted on. The first is sort of a fingerless glove in itself, with a large diamond-shaped opening in the palm; on the back at the knuckles are four little triangular flaps, the free ends pointing towards the fingers. 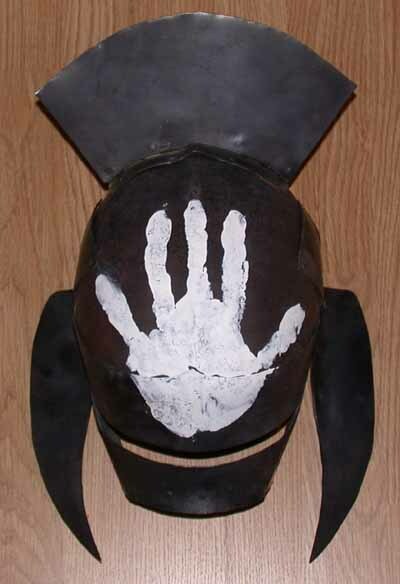 There is apparently a corresponding hole in the palm of the gauntlet itself (in fact the photo makes the whole thing look fingerless, with a dummy orc-hand wearing it, but I don't think that's correct). On top of that is a sort of oblong piece, covering most of the back of the hand. The upper layer is sort of like a long heart shape, with two lobes on the back of the hand, and the point towards the elbow. 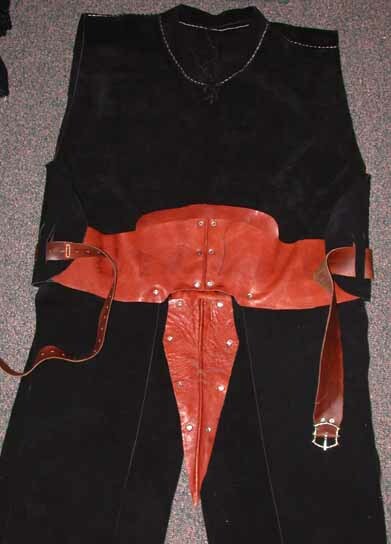 Running most of the length is a raised ridge, like that on the over-vest, belly piece, and codpiece. Around the wrist and under the ridge runs a strap, with a buckle underneath. Here is my finished left gauntlet, with the parts of the right one. I used a regular pair of leather gloves from a thrift shop, lopped off the short cuffs and added longer ones. In the middle are the two reinforcing layers--the crappy re-used leather on the lower one is mostly covered by the upper. At top is my estimation of the wacky "over-glove" layer of brown suede. The tapered right side lays across the palm, and the fingers go through the diamond-shaped holes; the flat edge at the top folds down at the back and is stitched under the points along the knuckles. The wierd extension off the left wraps around under the thumb and connects to the slanted edge across the palm. I have taken the liberty of omiting the large hole in the palm. There is a metal gorget or throatguard attatched to some orcs' armor, with a pointed upper edge. It really gets in the way of the shoulder yoke! It makes the inner edge turn upwards and look like a standing collar. The heavy Uruk-hai (and some of the lights) wear shoulder guards or pauldrons. The top piece is dished to fit over the shoulder, and there is a vertical flange around the top edge. From the bottom edge hang four strips or lames, apparently articulated on internal leather strips. On all five pieces there is a central ridge or rib, and the bottom edges come to a slight point where the ridge meets them. 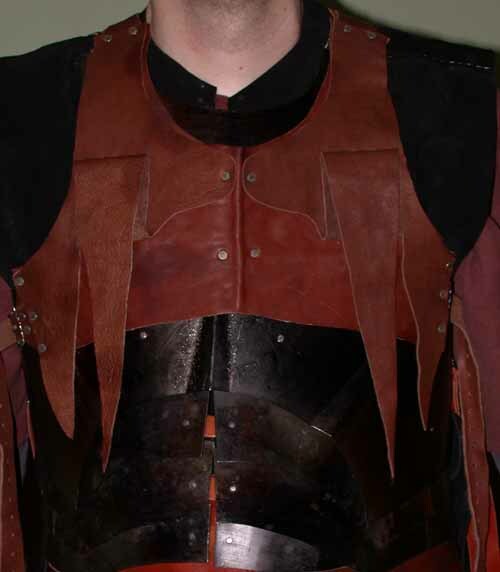 The "heavies" are more likely to be wearing breastplates with gorgets but without the over-vests, and crested iron helmets, as in this still from The Two Towers: http://www.theonering.net/movie/scrapbook/large/3717. Many of them are clearly wearing chainmail under their plate armor, as well, though no mail is visible at Amon Hen. 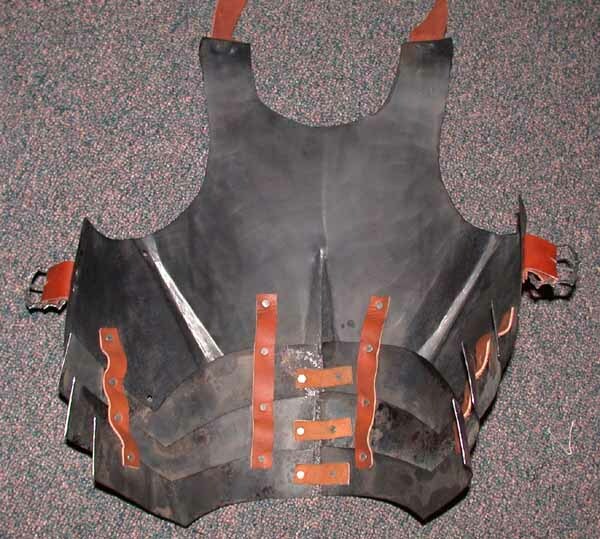 The Alley Cat Scratch "Orcs" page has photos of Uruk-hai heavy armor props from The Two Towers, though the breastplate and pauldrons lack the articulated lames. Even more photos here: http://www.glittersweet.com/armageddon.htm (Thanks, Michaela!). Some of the "heavies" wear full-length vambraces on their forearms, but I don't have clear pictures. Some of the uruk-hai with pole arms at Helm's Deep have a large vambrace on the left arm that is shaped very much like the shields carried by the others, only smaller. Some also have studs or blades on their gauntlets. And finally, there are optional foot guards, 3 or 4 simple overlapping plates on top of the foot. 18-gauge steel, hammered and bent into shape. The body measured c. 21" by 26" when it was flat, before shaping. The spikes are 16-gauge steel, 10-1/4" long by 3" wide, and they project 7" beyond the end of the shield. The handle is also 18-gauge, a strip 2-1/4" wide with the edges folded in to overlap. The upper arm strap is leather, with a buckle. I fire-blackened all the metal parts and riveted them together with domed steel rivets. It came out really well! Armoring Links--Metal, plastic, paper mache, you name it! Construction of a Moria Orc, by Ed Martinez and Nina Kempf-- http://www.alleycatscratch.com/lotr/Nasty/Orc/Making/MakeMoria.htm. OUTSTANDING work! 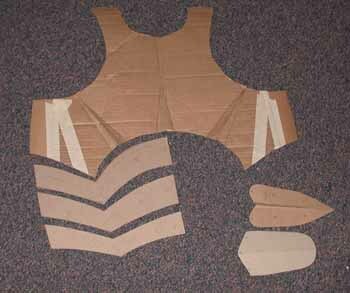 JediElfQueen costuming website--Yes, elves, but EXCELLENT for making armor with foam, cardboard, etc. You like Nazgul? Check out Guillaume's gauntlet! Black 18-gauge steel, 30 hours of work!